Retirement Roadmap & Bucket Strategy | Advanced Planning Solutions, Inc.
Once the fact gathering, goal creation, education and RiskPro assessment is complete it is time to tie it all together into a roadmap to get you to retirement. A retirement roadmap is not a static document, but rather an ever changing one meant to accomplish your retirement goals. As life continues to unfold your income may change, families members may come and go, inheritances may occur, and the list goes on and on. Each event triggers a change in your retirement roadmap that we will address as it occurs. As your life changes, so does the route you take toward and through retirement. 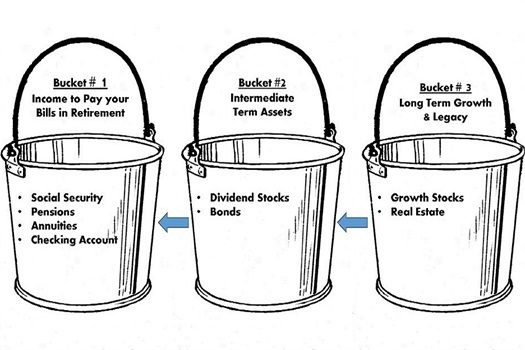 The investment portion of the roadmap is determined through a Bucket Strategy where each client fills their bucket with different assets, but with the same overall objective. The first objective is to make sure that their is income to pay for basic living expenses, the second bucket invests in intermediate assets designed to pay for more infrequent expenses, and then we invest the final bucket for the long term.